An athlete is defined as a person who participates in individual or collective sports (at any age) as well as training programs of systematic and regular competitions , but the true definition of athlete is a person who explores his/her physical and mental limits . In Italy since 1982 there has been a current legislation that requires every athlete to undergo a clinical evaluation before becoming eligible for competitive sports [3-5]. The purpose of sports pre-participation screening is to identify athletes who suffer from underlying cardiovascular abnormalities and hence lower the risk of sudden death during sports [6,7]. The screening protocol consists of knowledge of complete family history, from a medical anamnesis, physical examination, and 12-lead ECG at rest and after submaximal stress test, while for master athletes or athletes with cardiovascular risk exercise ECG stress testing is mandatory. Therefore, the main purpose of the physician specializing in sports medicine, and also dedicated to cardiology sport, is not to disqualify or penalize the athletes but conversely to prevent dramatic events and to recover the athlete so that he/she can resume sports activities in absolute security . The importance of early identification of clinically silent cardiovascular diseases at a pre-symptomatic stage relies on the concrete possibility of SCD prevention by early intervention, including revascularization in silent ischemic disease and temporary abstention of competitive sports activity, but also by prophylactic treatment with drugs and implantable defibrillator in cases of dangerous arrhythmias . Research and debate in relation to PPS has largely focused on young professional athletes (≤35 years of age). However, recent years have borne witness to a dramatic increase in amateur participation in endurance events, such as half marathons, marathons and triathlons, with the average age of London Marathon entrants being 49 years. In such individuals, the etiology of SCD differs greatly in comparison to young athletes, in whom inherited and congenital causes predominate. In a large observational study by Kim et al. assessing 10.9 million marathon and half-marathon runners over a 10-year period, 59 fatal and nonfatal cardiac arrests were documented, yielding a remarkably low SCD incidence of 1 in 259,000 . HCM remained the most important underlying etiology, followed by coronary atherosclerosis, which was documented in almost a third of cases. Our own experience of the London Marathon is an SCD rate of 1 in 80,000, the vast majority due to coronary atherosclerosis . The major implication of this finding for the screening of older individuals lies in the fact that the resting ECG will fail to detect quiescent coronary artery disease in the absence of prior myocardial infarction. The ESC has therefore issued guidelines for the cardiovascular evaluation of middle-aged and senior individuals engaging in leisure-time sporting activity . Sudden death risk should be assessed by means of a questionnaire aimed at eliciting symptoms of cardiac ischemia, as well as assessment of cardiovascular risk factors or established atherosclerotic disease. In individuals deemed to have a high likelihood of atherosclerosis, maximal exercise testing is recommended before eligibility for moderate- or high-intensity physical activity. However, even this strategy may have its limitations, since exercise testing can fail to detect vulnerable, non-obstructive plaques that might theoretically become unstable under the stress of intense exertion. 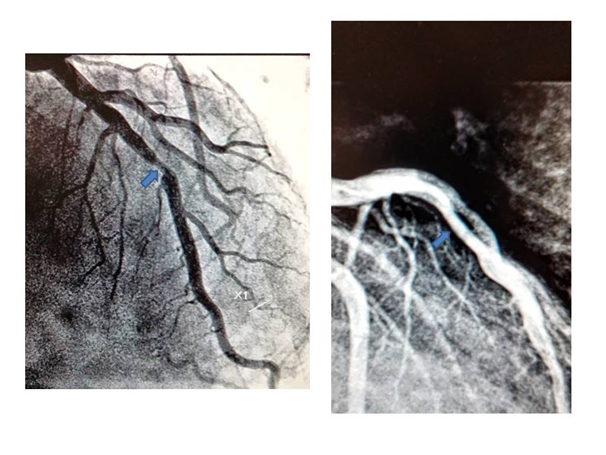 Such considerations have led some to advocate computed tomography (CT) calcium scoring or CT coronary angiography in the assessment of middle-aged athletes with adverse cardiovascular risk profiles, although availability, cost and radiation exposure are currently limiting factors for such a strategy. Despite the prevalence of non obstructive CAD identified by coronary angiography, little is known about its risk of adverse outcomes. The few studies that do exist focus primarily on patients with MI , and thus are less informative about patients with stable non obstructive CAD. A primary reason behind this lack of knowledge is lack of data. To date, almost all coronary angiography registries include obstructive CAD only . The few registries that do include patients with non obstructive CAD lack longitudinal outcomes data . Literature has recently reported that non obstructive coronary artery disease (CAD) is associated with an increased risk of MI at 1 year compared with individuals without any coronary disease, according to a large analysis of patients in the Veterans Affairs healthcare system . According to the literature, athletes older than 35 years old may die due to complications of coronary heart disease often caused by atherosclerosis [16-19]. The leading cause of SCD in athletes aged >35 years is atherosclerotic coronary artery disease (CAD), identified in more than 80% of cases . Prolonged and strenuos exercise can lead to transient activation of the coagulation system, which promotes a pro-thrombotic environment . Also metabolic and haemodynamic changes during exercise may contribute to stress-related plaque rupture observed in sports- related victims of SCD . On autopsy, coronary atheroma with significant luminal obstruction (>75 %) may be present [16-23] with associated features indicative of acute or chronic myocardial infarction. However, plaque rupture, thrombosis, acute infarction and fibrosis are not prerequisites for the cause of death to be attributable to CAD. In such cases, the presumed mode of SCD is sudden ventricular arrhythmia due to myocardial perfusion-demand mismatch and resultant ischemia . The rapidly expanding population of older veteran or amateur athletes who compete in high-intensity events underscores the importance of preventing SCD in this age group. The resting 12-lead ECG is of limited value in screening senior athletes, as CAD is the main cause of SCD . The Sports Cardiology section of the European Association of Cardiovascular Prevention and Rehabilitation published recommendations relating to screening practices, which take into account the burden of cardiovascular risk factors, pre-existing fitness levels and intended level of exercise . The assessment of athletes undertaking high intensity physical activity incorporates the assessment of cardiovascular risk factors, symptoms and family history, physical examination, resting 12-lead ECG, and the Systematic Coronary Risk Evaluation (SCORE) to assess the 10-year risk of a fatal cardiovascular event. Any abnormalities arising from this initial assessment, including a SCORE 10-year risk of ≥5 %, requires maximal exercise ECG testing. However, it is well recognized that the sensitivity of exercise ECG stress testing in a screening setting with predominantly asymptomatic individuals is poor (25 %), as literature reports  and the false-positive rates are high, particularly in women . Nevertheless, a negative maximal exercise ECG stress test provides eligibility for moderate/high exercise training while a positive test result will require further investigation for underlying silent CAD, therefore the gold standard test being invasive coronary angiography . An area deserving further consideration is whether computed tomography coronary artery calcium scoring (CACS) can provide a better risk prediction of serious cardiovascular events, as high calcium scores appear to predict increased risk for cardiovascular events in the general population, including asymptomatic individuals . Obstacles to the wider implementation of CACS as a screening tool include radiation exposure (though minimal at 1.5–3.0 mSv), availability and cost. 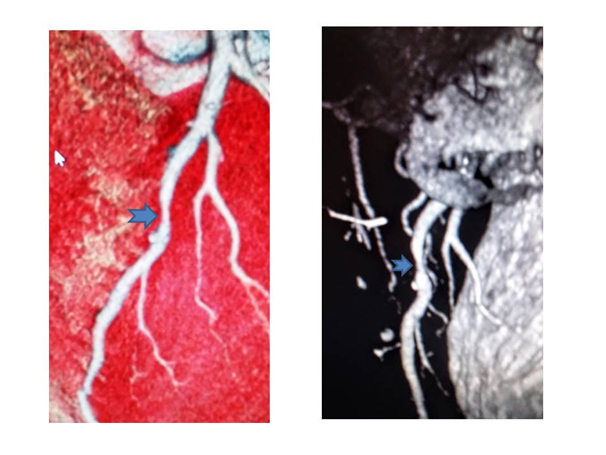 To explain the importance and controversies of sports pre-participation screening here the author reports a case study of an otherwise healthy and heavy 50 year old male triathlete], with unremarkable family history and devoid of traditional cardiovascular risk factors, incidentally found with non-obstructive coronary artery disease located to the IVA by Coronary Computed Tomography Angiogram (CCTA) performed for left shoulder pain irradiating to the chest. 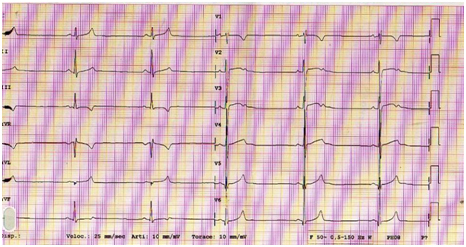 History: following a shoulder pain a 50-year-old male triathlete presents to emergency department where resting ECG showed marked bradycardia and T waves changes on precordial leads suggesting early repolarization (Figure 1), but he was referred to cardiologists anyway. He was asymptomatic and the physical examination showed no relevant alterations, with blood pressure 140/80 mmHg, heart rate 36 bpm and body mass index 20.7 kg/m2. He denied taking any regular medication or substance abuse (tobacco, alcohol or anabolic steroids). Cardiac auscultation revealed regular S1 and S2 and no murmurs, and pulmonary auscultation showed normal breath sounds, with no adventitious sounds; there was no peripheral edema, and distal pulses were palpable, strong and symmetric. The consultant cardiologist believed it necessary to refer the athlete to non-invasive investigations such as echocardiography and computed tomography coronary angiography (Figure 2), which showed no changes in myocardial kinetics but nevertheless showed the presence of a eccentric plaque with narrowing of the anterior descending branch of the left coronary artery. These findings called for a subsequent coronary angiography (Figure 3) which confirmed the plaque in IVA with 60% narrowing of the lumen, but FFR was absolutely normal (ratio 1), so no cardiovascular procedure was performed. Both the exercise ECG stress and echo-stress tests were absolutely normal. Despite the absence of inducible myocardial ischemia the triathlete was deemed unfit for competitive sport and therefore disqualified. So, no sports doctor has considered his situation for possible fitness for competitive sports. In conclusion, despite the absence of any cardiovascular risk factor and any sign of functional myocardial ischemia this middle-aged triathlete was disqualified for competition, only because of evidence of non-obstructive coronary artery disease. Such attitude might be debatable. 1) Can the presence of non-obstructive coronary artery disease be considered a risk for an otherwise healthy and efficient athlete in the absence of other cardiovascular risk factors? 2) Can the presence of a moderate stenosis of the IVA in the absence of inducible ischemia be considered as a sufficient reason to disqualify an athlete? 3) How many endurance master athletes might be unaware that they have a non-obstructive coronary artery disease? 4) What criteria state that in the absence of inducible myocardial ischemia an athlete should be banned for life? 5) Is the demonstration of morphological coronary atherosclerosis sufficient to declare an athlete ineligible to competitive sports? 6) Can coronary stable plaque in the absence of inducible myocardial ischemia be considered a potential hazard and risk of sudden death in healthy athletes? The challenge for broad-based screening programs is to identify those at risk while minimizing harm through unnecessary exclusions from sport. However the certification of eligibility for competitive sports is not without risks and dangers, as for all other screening programs. Just as patients with underlying heart disease risk of sudden death, also other athletes with abnormalities, who do not run this risk, are susceptible of being penalized. Essentially screening may overestimate the risk of sudden death in an athlete with no obstructive coronary artery disease, and this case proves it. I believe that the Italian legislation should not identify recreational athletes as professional athletes in the same sport, so there is a need to modify this requirement for recreational veteran or middle-aged athletes, who need to take on themselves the responsibility for participating in competitive sports. For the 50-year-old endurance male triathlete featured in this review, acquired coronary vascular disease represents 1 of the greater risks for SCD. Kim et al. reported that among marathons completed in the United States, 2 in every 100,000 male athletes (mean age 52 years) suffered SCD, an incidence that seems to have increased in recent years. Among the 8 survivors of cardiac arrest in this study, causation was attributed to non-obstructive atherosclerotic disease in 5 athletes, none of whom had angiographic evidence of ruptured plaque. This raises the question as to whether otherwise stable coronary artery disease could constitute a risk for SCD among the milieu of hemodynamic, catecholaminergic, and other stresses during a marathon or similar endurance competition. In this context, if screening were to be performed in our 50-year-old athlete, it may be prudent to include evaluation of his coronary arteries with CACS and/or CTCA. Both have been promoted as “promising tools” for screening asymptomatic veteran athletes  on the basis that they have proven value over clinical risk factors in the prediction of myocardial infarction and SCD, particularly among those of intermediate risk [32,33]. However, there are a number of arguments against screening asymptomatic athletes with coronary artery calcium scoring (CACS) and CTCA. Apart from the financial cost of screening a low-risk cohort and the potential to cause harm due to contrast reactions and radiation exposure (accepting that this has been substantially reduced and now constitutes a relatively small dose), the first concern is whether a significant finding on CACS or CTCA changes the management of the athlete. It is frequently argued that informing an asymptomatic individual of the presence, or likely presence, of coronary artery disease will increase physician and patient motivation to aggressively adhere to pharmacological and lifestyle prevention interventions . There have been 2 randomized controlled trials that investigated this hypothesis. Rozanski et al. randomized 1,424 subjects to risk factor management including CACS and 713 subjects to management without CACS and determined that scanned subjects had a slightly greater reduction in systolic blood pressure (–7 mm Hg vs. –5 mm Hg, p = 0.02) and low-density lipoprotein cholesterol (–17% vs. –11%, p = 0.04), but there was no difference in medication adherence, smoking cessation or exercise and the CACS strategy tended to be more expensive ($US 4,053 vs. $3,649, p = 0.09) . Although considerable attention has been focused on young athletes, the risk of SCD is greater among sports participants older than 35 years and is greatest in the fifth decade . Prevention strategies aim to identify cardiac pathologies that may serve as a substrate for arrhythmias triggered by exercise. In general, inherited cardiomyopathies are the most frequent cause of SCD in young athletes while acquired heart disease, principally coronary artery disease, is most frequent in athletes of middle age and older . However, there is considerable overlap, particularly among 30- to 50-year-old athletes and it may also be that the incidence of inherited cardiomyopathies is underestimated in this group as autopsies are less often performed and coronary disease causation more frequently presumed. The methods of how middle-aged and older individuals should be evaluated before engaging in regular physical activity are controversial. On practical grounds, such evaluation should vary according to the individual’s cardiac risk profile and the intended level of physical activity. To pre-select high-risk subjects, self- assessment of their risk factors and habitual physical activity level are recommended for screening of large populations. When more elderly athletes, including those with known diseases, are advised to exercise, the issue of screening gains further relevance. Athletes represent a group in whom the risks of cardiovascular events and SCD are extremely low. The causes of SCD are relatively diverse and are not accurately identified by any one imaging test, especially in the middle-aged athlete who represents a substantial proportion of competitive sports participation. At present, we have an incomplete understanding of what constitutes the normal range of cardiac morphology and function among athletes of all ages and ethnicities. This is especially true for novel techniques and imaging modalities other than the most basic echocardiographic measures. As exemplified by the instances in this review, atypical findings such as marked cardiac dilation, reduced deformation or small patches of delayed gadolinium enhancement may introduce uncertainty in the asymptomatic athlete in whom the risk of SCD is extremely small. Therefore, we do not believe that cardiac imaging can be recommended as a first-line screening tool. Rather, patient specific investigations should be focused on evaluating those athletes in whom clinical suspicion is raised by symptoms, family history, clinical exam and/or abnormalities on ECG. While it is imperative that we continue our efforts to safeguard athletes, we must also recognize the current limitations of our tools in predicting SCD in low-risk populations. The approach to these asymptomatic athletes remains controversial, especially in cases in which there is a discrepancy between real cardiovascular risk only based of the atherosclerotic burden due to non obstructive coronary plaque, as documented by cardiac CT, without any documentation of myocardial ischemia. Corrado D, Pelliccia A, Bjornstad HH, et al. (2005) Cardiovascular pre-participation screening of young competitive athletes for prevention of sudden death: proposal for a common European protocol. Consensus Statement of the Study Group of Sport Cardiology of the Working Group of Cardiac Rehabilitation and Exercise Physiology. Eur Heart J 26: 516–524. Maron BJ, Zipes DP (2005) 36th Bethesda Conference: recommendations for determining eligibility for competition in athletes with cardiovascular abnormalities. J Am Coll Cardiol 45: 1373–1375. Sports Cardiology Medicine Center, AUSL della Romagna - District of Cesena, Via Ungaretti 494 - 47521 Cesena, Italy, Tel: +390547645074.